I rescued an owl the other day. I went to a friend's house and his neighbor walked over to tell us an owl was tangled in their fishing line. They have a large pond and the husband often leaves his fishing poles outside. One was leaning against a chair and we think the owl landed on the back, snagged himself, and entanglement ensued. When we got there, it was hanging upside down from a tree branch. It had struggled throughout the tree because the line was wrapped around 4 or 5 branches. By then, it was alive but completely exhausted. The feathers & skin on one leg had been completely pulled down like a sock, exposing flesh. No one knew what to do, so I took the initiative. First I tested to see how much fight he had left in him. His talons were about an inch long & I wanted to see if he was still lively enough to use them on me, but he put up zero fight. The only thing he'd do was blink & turn his head, he couldn't even fold in his wings. It would've made it more difficult, but I would've been much happier if he had put up a fight because at least that meant he had a lot of life left in him. He must've been struggling for hours & was probably dehydrated too. So I lowered him to the ground & wrapped him in a towel. The guy kept insisting that none of the lines had hooks on them, until I showed him the treble hook that I removed from the skin that had been torn away. He was breathing well, so we thought he had a good chance. I put him in a dog kennel to be safe. He just laid there for a good half hour, so still at times we thought he was about to pass. We called the nearest rescue shelter (we only have one and it's about 30-45 min. away) and they were going to send a volunteer to get him. There wasn't anything else we could do, so we left to get lunch. Shortly after, the neighbor called and said the owl jumped up and was standing on both legs. The volunteer eventually got there, said the owl looked good (other than the leg injury) and expects a full recovery. When it does, they'll bring it back to release there because they're territorial and he might have a mate. I just hope the guy stops leaving his fishing poles laying around now. The above image is stock. I wish I had a picture to share but I was so involved with what I was doing, I didn't even take one. The volunteer said recovery would probably take about 3 weeks. I'm hoping I get to see it released when they bring it back. If so, I'll be sure to take photos. 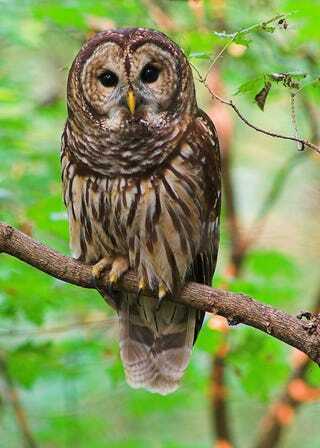 It was a barred owl, more commonly called a hoot owl.